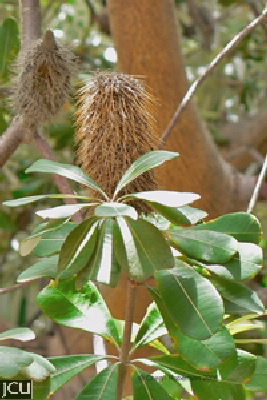 This small tree has dark rough bark and may reach a height of 25 m. The leaves are in whorls of 3-5, leathery, oblanceolate, between 4 and 15 cm long and 1-2.6 cm wide, dull green above but white on lower surface due to hairs. Flowers cream in a dense cylindrical inflorescence. The follicles are embedded in the remains of the inflorescence so forming the ‘typical banksia cone’ which is up to 12 cm long. This species is similar to a species common on the northern ranges B. aquilonia, however the leaves in the latter are alternate though often crowded rather than in whorls.